Traders who don’t mind spending a lot of money in commissions who appreciate the security of TD Ameritrade’s physical branch locations in the US. TD Ameritrade is one of the largest and most well-known online discount brokerages in the world. Back in 2009, TD Ameritrade acquired a smaller, yet very popular, online brokerage called thinkorswim for a tidy sum of $606 million. Acquiring thinkorswim, which catered mostly to active options and futures traders, was probably one of the smartest moves TD ever made. To get straight to the point, there is only one reason why traders like to trade options at TD Ameritrade…the thinkorswim platform. 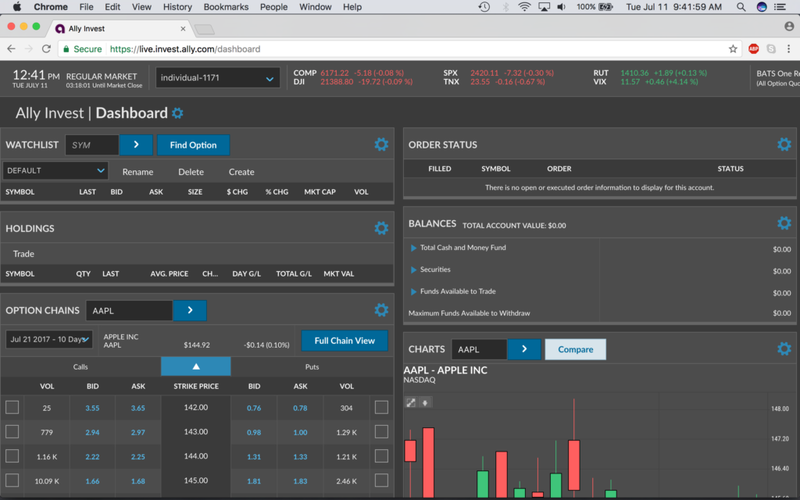 The platform is downloadable for both Windows and OSX and it is so good that traders, for a long time, had no problem paying TD Ameritrade’s ridiculous price of $9.99 per option trade plus $0.75 per contract. To stay more competitive, TD recently slashed its benchmark commission rate making it an even more appealing choice for active options traders. To put things in perspective, in 2016, TD Ameritrade reported net operating income of just over $1.3 billion. There are over 100 branches in more than 33 states in America, and TD Ameritrade employs more than 6,000 full-time employees. In terms of funded client accounts, there are over 7.3 million, and the net assets TD holds are just over $882 billion! Needless to say, TD Ameritrade is a popular choice among retail investors and traders and the firm is not going anywhere. But what makes it so popular? Writers at The Options Bro have a couple of theories as to TD’s insane popularity, but we mostly seem to agree a large part of it comes from thinkorswim. Although almost all options brokers in 2017 offer stellar mobile and desktop trading platforms, thinkorswim is one of the highest rated platforms of all-time in the Google Play and Apple App stores. It’s fast, easy to use, robust, and capable of analyzing and trading tons of options strategies. It truly is the cream of the crop. *Although TD Ameritrade’s commissions and fees are not the lowest in the industry by a long shot, they are negotiable. One of the traders at The Options Bro has managed to successfully reduce the futures rate to $1.85 per contract by trading 300 contracts in one month. Similarly, if you frequently trade single lot options, you can ask the trade desk to change your commission structure to charge $1.50 per contract with no ticket charge. The $19.99 fee for option assignment and exercise is something nobody seems to understand. Why is it so high? Several other options brokers offer assignment for $4.95. Several brokers off it for free. 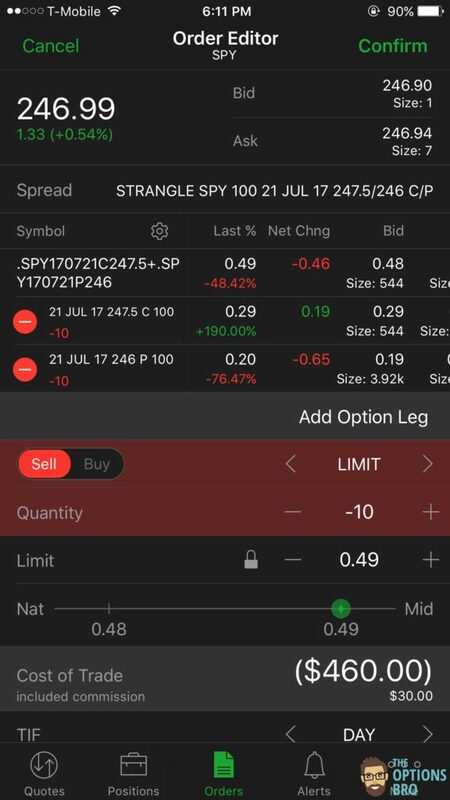 This $20 charge to let options positions expire in-the-money is ridiculous and costly. However, option writers will LOVE the fact that any short options contracts with a value of $0.05 or less can be closed out for free! No commission charge! Outgoing wire transfers are FREE at TD Ameritrade for all APEX accounts. To qualify as an APEX client, the total account value must be over $100,000, or 5 or more trades need to be per month in a three month period. Basically, what this means is, if you’re an active options trader, you get an unlimited amount of free wire transfers with TD Ameritrade. Pretty nifty if that’s how you pay yourself every week. What can we say? 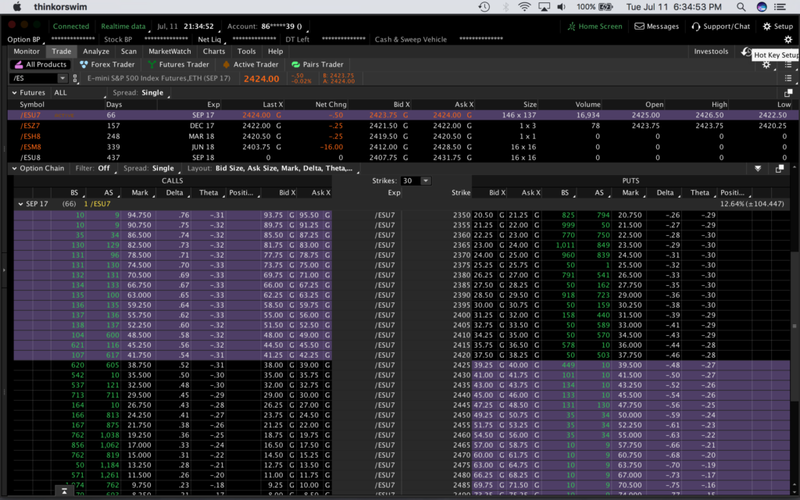 thinkorswim is probably the best piece of free retail options trading software to ever be created – seriously. Professional options traders will see many similarities between the thinkorswim platform and the Silexx Obsidian platform, which is a favorite among market makers and derivative-based hedge funds. 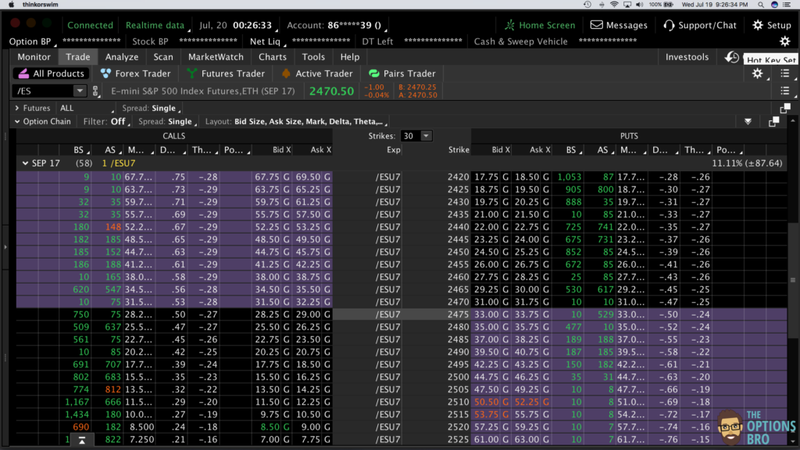 The thinkorswim platform has everything from advanced charts, options chains that load quickly, detailed position management tools, in depth analytics, a market calendar, and customizable watchlists. 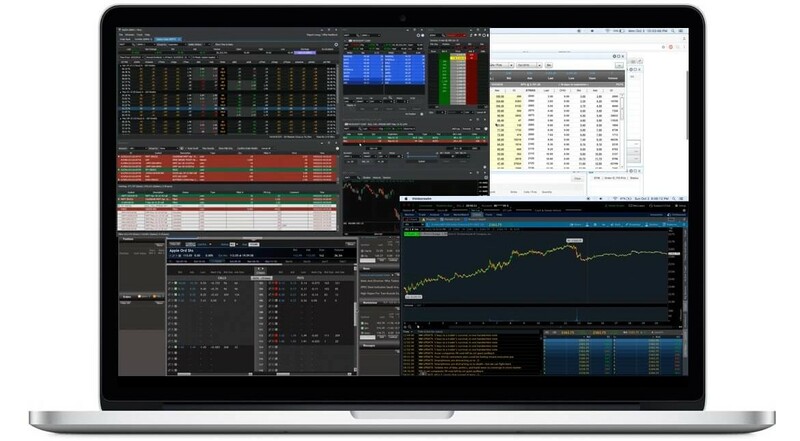 One of the best aspects of thinkorswim is that it is fully compatible with PCs and Macs, not to mention it’s completely free! Of course, standard things like font size, color, etc. are all customizable. Option chains on thinkorswim are a thing of beauty. 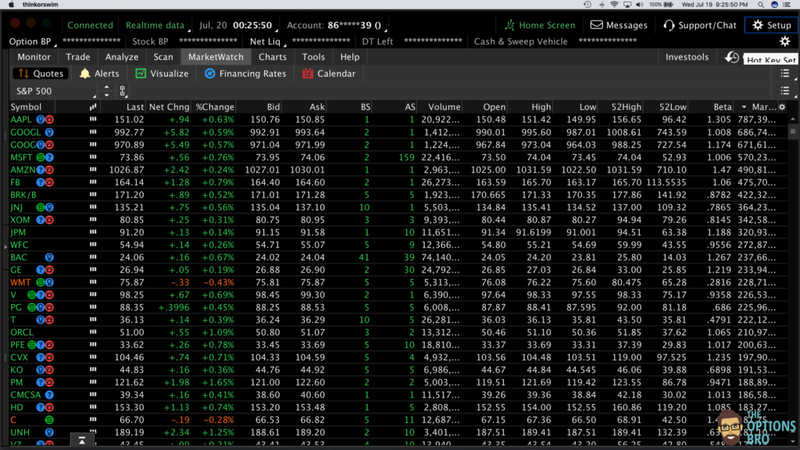 You can customize each column with bid/ask prices, last traded prices, mark, volume, open interest…the list goes on. We have never experienced any delays in loading data that is typical with some option chains when scrolling up or down rapidly. thinkorswim is lightning fast. Charting with TD Ameritrade is top-notch. You can choose from hundreds of different technical analysis patterns and studies and/or apply basic things like Bollinger Bands and moving averages. As part of our annual review and constant testing, we loaded over all 500 components of the S&P 500 on the thinkorswim watchlist. The result? The watchlist produced real-time quotes and market depth data for every symbol. If there’s one certainty, it’s that thinkorswim platform loads data quick. Watchlists are great because you can keep track of your current account positions as well as sort stock, futures, indices, and even individual options contracts by various metrics. 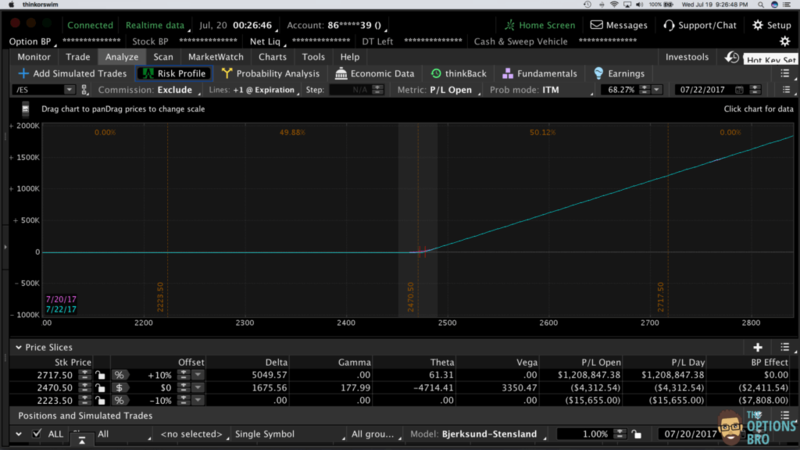 In addition to advanced analytics and “what-if” testing, thinkorswim offers “thinkback” which is a sophisticated tool to backtest your options trading strategies with years of historical market data. 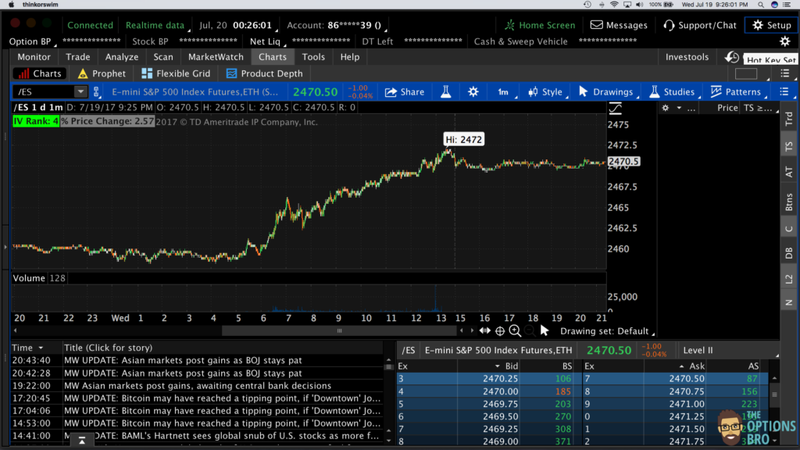 Perhaps one of the more underrated of the thinkorswim platform is the ability to quickly find futures symbols, and therefore futures options symbols, very quickly. Some brokers like OptionsXpress have the absolute worst symbol finding feature you could possibly imagine. 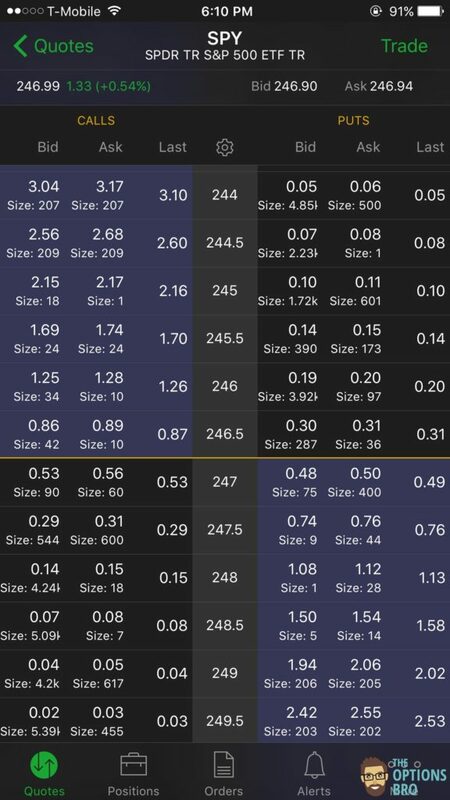 With thinkorswim, you can also see the tick size, tick value, and initial margin requirement all from one easy place in the platform! It’s so simple and easy! 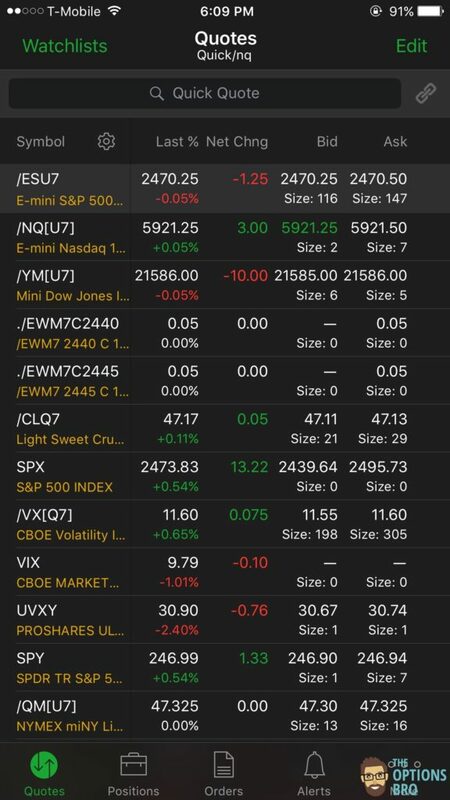 Except for some of the options analytics tools, the mobile version of thinkorswim has everything that the desktop version has. It has more than everything you need to trade on the fly and manage your positions. Multi-leg options orders are not a problem. We have relied on the mobile version hundreds of times while we’re waiting at airports, perched at coffee shops, or merely walking down the street. We also use it for market alerts. For the active options trader who has dozens and sometimes hundreds of positions on, it’s incredibly soothing to be able to monitor and potentially close any positions at anytime. The mobile watchlist functions exactly like the desktop watchlist. The mobile option chain loads data points fast and accurately. Mobile order management is phenomenal. Level II trading data is free at TD Ameritrade for all futures and equities and their respective options. Plus, there is a useful streaming market news feature on both the desktop and mobile platforms that is free of charge. There are no minimum trading requirements to receive real-time quotes and trading data. 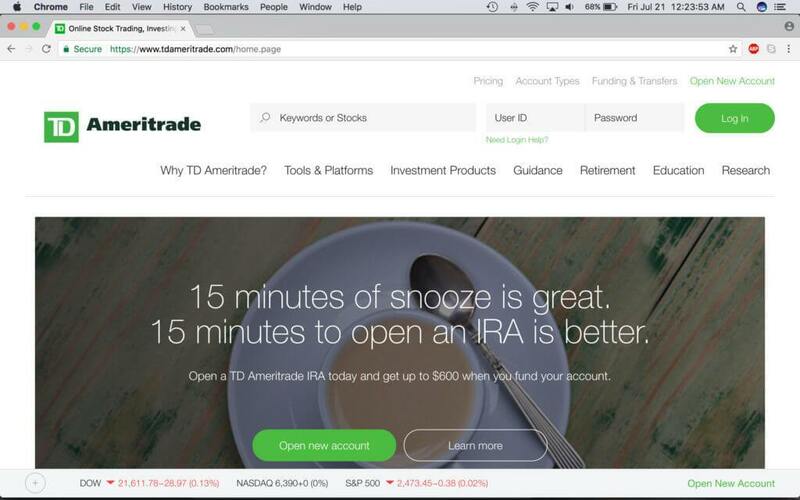 A lot of traders have reported difficulty with approval for uncovered options trading with TD Ameritrade. Although it seems to be a matter of checking the right boxes and having a “high” income, chances are if you apply for an account you may not be approved for uncovered options right away. It usually only takes an email to customer service to remedy this. Once you’re approved, TD Ameritrade offers uncovered options trading with reasonable capital requirements. TD Ameritrade offers 24/7 support over the phone. Additionally, they offer excellent live-chat support via the mobile and desktop platforms. Once you start a support request, someone will typically answer within 1-10 minutes. As they saying goes, you get what you pay for. That’s the case with TD Ameritrade. Pro-level options trading software that is equivalent of thinkorswim costs close to $200 per month, i.e. Silexx Obsidian. Great trading technology and outstanding customer service come at a price, and that price is a $19.99 option exercise/assignment fee and $6.95 + $0.75/contract option trades. Although commissions with TD are negotiable, their rates are much higher than several other discount brokerages. If you’re a super active options trader, commissions add up really fast. At the end of the day, you really have to ask yourself if advanced trading technology is worth paying more money in commissions. If that answer is yes, then TD is great. It’s also worth noting that although TD Ameritrade has an API program, it does not currently support futures trading. Therefore, it’s possible to connect third-party trading applications to TD’s servers and receive their data, but you wouldn’t be able to receive any futures data. But there’s sort of no reason to do this since thinkorswim is such a terrific trading platform.